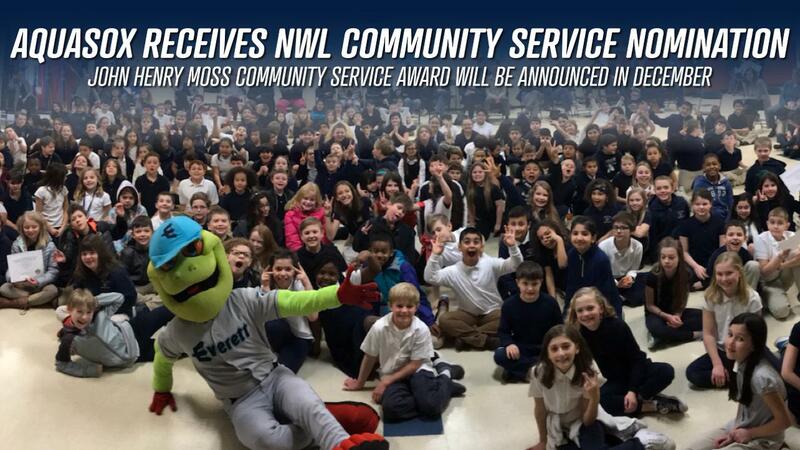 Everett, WA - The Everett AquaSox have been selected as the Northwest League nominee for Minor League Baseball's John Henry Moss Community Service Award. The John Henry Moss Community Service Award is awarded to a club that demonstrates an outstanding, on-going commitment to charitable service, support and leadership within their local community and within the baseball industry. Throughout the season the AquaSox tied theme and promotional nights to the community by partnering with multiple local organizations. This season the AquaSox partnered with Braden Bishop, former Everett AquaSox outfielder and currently Seattle Mariners prospect with his 4MOM Foundation for Local Heroes Night. Braden's mother, Suzy, was diagnosed in September 2015 with early-onset Alzheimer's. The night originally was planned to be a Braden Bishop bobblehead giveaway, Everett Fire versus Police Department Home Run Derby and a donation drive for the 4MOM Foundation. Due to a season-ending injury, Braden was able to join the AquaSox for his very own bobblehead giveaway. With his appearance, the AquaSox and fans raised $2,500 for 4MOM Foundation. "We love supporting the Everett community and beyond year after year," said General Manager Danny Tetzlaff. "Being recognized for all our efforts by our peers in the Northwest League is very fulfilling." Providence Regional Medical Center and the AquaSox worked together annually for Pink in the Park. This event raises money for the Providence Comprehensive Breast Center. Proceeds from the night along with a Star Wars jersey auction on Star Wars Night, June 23 allowed the AquaSox to donate over $5,600 to the Providence Foundation. In addition to Pink in the Park, the AquaSox supported Hilinski's Hope during Coug Night raising $1,503. Hilinski's Hope is a foundation geared toward mental health awareness in memory of Tyler Hilinski, who was the Washington State Cougar Quarterback that ended his life earlier this year. After the August 12 game, the AquaSox hosted a Challenger Miracle League game in which fans of any age and disability come onto the field to play a few innings with our AquaSox players and coaches. It easily one of the best, and most humbling experiences one can have on a field. "In my first year with the AquaSox, I am proud to be a part of an organization that supports the community and one the community supports," Director of Community Relations & Merchandise Ashlea LaPlant said. "I look forward to the continued growth of our community outreach." Away from the ballpark Webbly and the staff were involved with multiple events including Little Leagues, National Night Out, non-profits, school visits and a welcoming fair for the newest crew to join the Everett Naval Base. The AquaSox made many new connections, fostered growth with current partnerships and set a new standard for our relationship with the Everett community. We look forward to even more growth in the 2019 season!